Water Sensitive SA is a capacity building program that provides stakeholders across all disciplines within the development and urban water management industries, with the support they need to achieve the best water sensitive urban design (WSUD) outcomes. Developers, planners, urban designers, engineers, landscape architects, scientists, builders and maintenance workers all have roles in the development of our cities and suburbs and many of them are recognising the value of WSUD and incorporating it in new infrastructure projects and developments. Water Sensitive SA provides these professions with access to the latest WSUD information, training on know how to apply it properly, an opportunity to gain valuable insight from the experiences of other, guidelines, tools and training to inspire and facilitate the delivery of best practice WSUD. 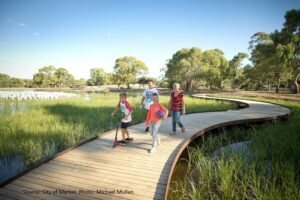 Every capital works project, infrastructure renewal and new development represents an opportunity for smarter water management that contributes to the creation of a more liveable, water sensitive community. Water Sensitive SA will bring about a cultural shift in which WSUD is widely recognised and embraced.